Happy Easter to all my readers and customers! Or if you don’t celebrate Easter, I wish you all the best for the season. Where I live it’s spring now and all my fruit trees are in blossom, which is lovely to see and has me looking forward to a future harvest of delicious cherries, pears, apples, peaches and plums. 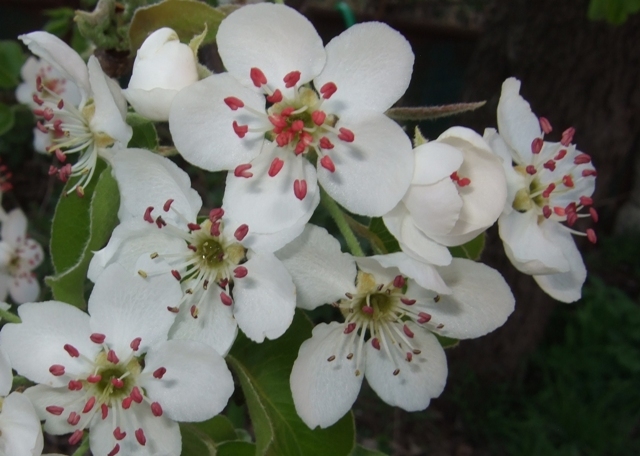 The photo is a closeup I took of some blossom on one of my pear trees. I love the red anthers. I’m also busy cultivating and sowing and planting, and imagining how wonderful my garden will look in a few months time, and what good things I’ll have to eat. So for me it’s a very inspiring and optimistic time of year. Books can also be a great source of inspiration, and one of the authors who inspires me the most is Barbara Sher. That’s why I was very happy and honoured to be the publisher of her latest book. 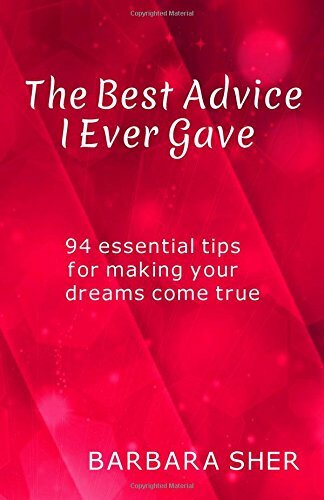 If you want something to inspire you over the coming long weekend, or a gift to buy for someone special, that little book of her best-loved tips might be just what you’re looking for. 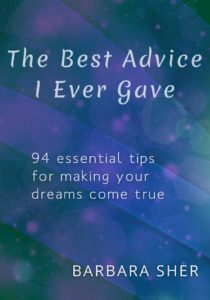 The best Advice I Ever Gave is now available in three different formats, so it’s easy to read it wherever you are, in whatever way you prefer reading. You can still buy it as a downloadable PDF directly from this website. Many people like that format best for reading on computers or laptops, and it’s suitable for other devices as well. The Kindle edition from Amazon is also very popular. But now, if you like to feel a solid book in your hands with real pages to turn, you can get it as a paperback, also from Amazon. The content of the three editions is almost identical, although I had to adapt the layout slightly to suit each one. But the cover of the paperback looks little bit different from the others. Here are the pictures of the front and back as they appear on the Amazon website. When you’ve read the book, come back and tell me in the comments which part inspired you the most. Barbara Sher’s new book is full of excellent tips, but I think that quote is especially good for the start of 2017, because it’s a year in which we are facing a lot of problems and uncertainties. It’s a time to stop worrying about what people think of you. Stop wasting effort trying to improve yourself. Instead start taking action to improve your life and your community and the world that we all share. I also decided to mark the new year by giving the cover of the book a bright new colour. A bit of cheerfulness is welcome at this this time of year for all of us living in cold and miserable winter zones of the northern hemisphere. We’re having an unusually cold spell now in central Europe. Brrrrrrr!! I’m envying my friends in the southern hemisphere, but of course you’ll get your turn at winter later. I’m giving away 10 printable quotes from the book, on the theme of taking care of your dreams, to everyone who signs up to my newsletter. They come as a pdf file with options of A4 or US letter size. They are perfect for putting on your wall or fridge, or anywhere you’ll see them often, to give you daily inspiration and motivation. If you like the quotes you’ll probably like the book even better. You can buy it from the books page. I was having teething problems with the newsletter sign-up process, but I found out how to fix it and it all appears to be working fine now. 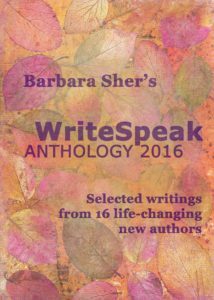 This is an exciting anthology of new writing by the graduates of Barbara Sher’s WriteSpeak program. In the selected excerpts from their books these authors cover a very wide range of topics and show a remarkable individuality of styles. What they all have in common is a strong desire to write and speak about their powerful ideas for helping people. 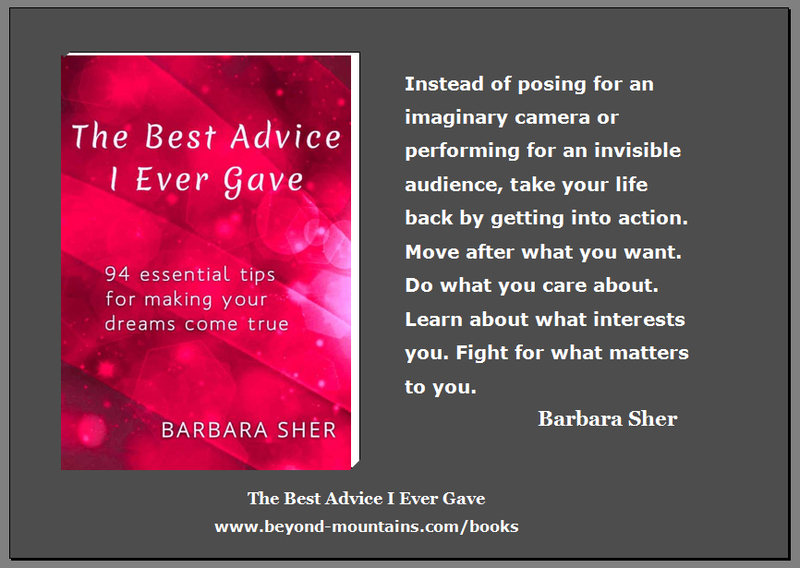 Barbara Sher’s new book of tips published! 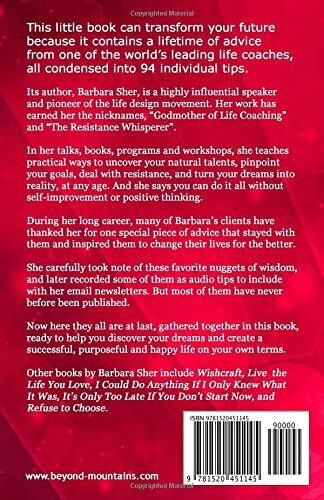 This is a new collection of Barbara Sher’s best-loved pieces of advice to her life-coaching clients. It’s now available for purchase as a downloadable pdf e-book. You can buy it directly from the button in this post, or from the Buy Books page. I’m delighted to announce that the first project of Beyond Mountains will be the publication of a new E-book by Barbara Sher, the New-York Times best-selling author and “godmother of life coaching.” I’ll have more news about the launching soon. admin on Barbara Sher’s new book of tips published! jane on Barbara Sher’s new book of tips published! 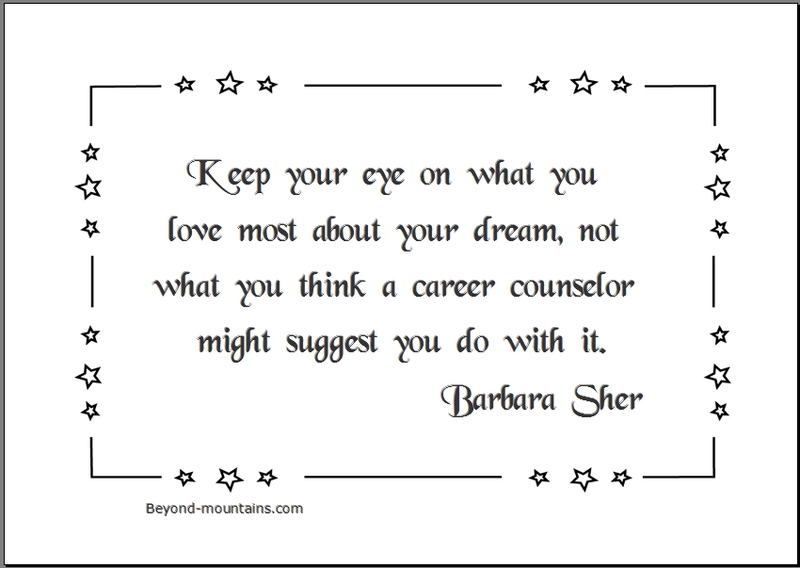 Subscribe to my mailing list and get 10 printable quotes by Barbara Sher to help you make your dreams come true. Copyright © 2019 Beyond Mountains. All Rights Reserved. The Magazine Basic Theme by bavotasan.com.